PS: RESIDENTS BEWARE! THE PROPOSED VIRGINIA ESTATE LAND APPEARS TO HAVE BEEN EXPANDED WITH THE ‘PARTNERSHIP’ OF THE MAKE PROPERTY GROUP. NOWHERE IS THIS MENTIONED IN THE DOCUMENTATION PROVIDED – EXCEPT ON THE MAP BELOW. 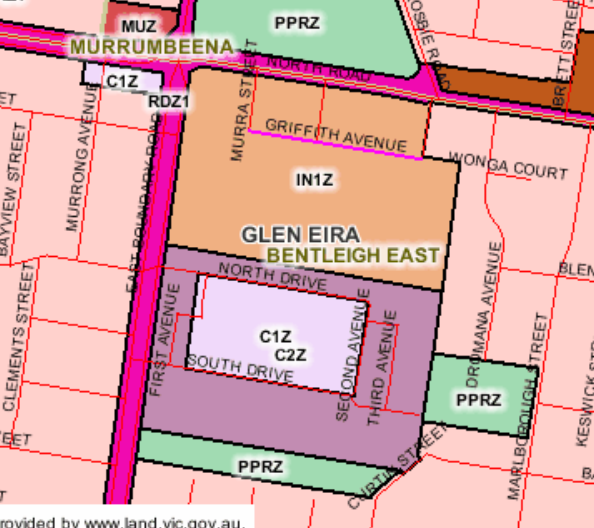 The land abutting Griffith Avenue is currently zoned Industrial Zone1 (ie no residential). Thus, the site under discussion would appear to have increased dramatically – without residents being informed in an open and transparent fashion! Not a great start for ‘consultation’!!!!!!!! Secondly, if the land mass is increased significantly, does this mean more dwellings? Another amendment that wants the entire area rezoned to Commercial 1? Or is it simply a case of a leopard does not change its spots? I have had a very brief look at their website. What strikes me as very important is that yes, the tone is far more conciliatory to residents but the crux of the issue doesn’t seem to have changed. Residential development scarcely rates a mention and they make it very very clear that the future isn’t going to be “industrial”. If it is not industrial then it will be residential. It is going to be under the banner of the euphemistically called “mixed use” which is what the amendment was all about in the first place – to put in plenty of housing and another shopping area. Scale is everything. Not a word about the ten storeys that they have already got permission for. 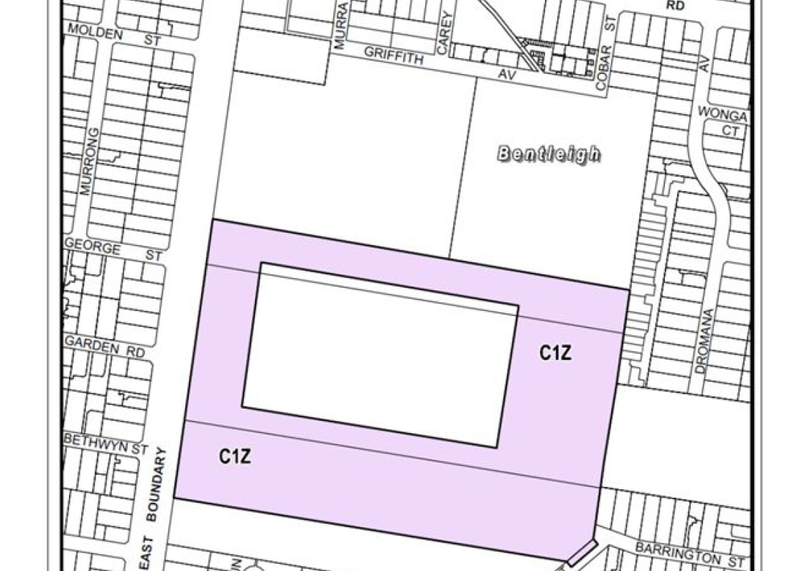 The biggest joke is that council rejected the amendment on the basis that it did not comply with their planning scheme and the “industrial” vision for Virginia Park. Will be fascinating to see what council does now. Will they amend the planning scheme and ditch this argument and come up with some other lame duck excuse? The future of the land should be an outcome of a review of the Planning Scheme, something that Council has consistently and persistenly refused to do, in conjunction with its strategic planning. None of this should be influenced by what maximises profit for the land owners. While Council policy is to request all major institutions to prepare Master Plans, that doesn’t apply here since we’re not dealing with major institutions. The land isn’t even strictly “residential”, although Council has admitted it doesn’t know what the term even means. Council policy doesn’t support the establishment of a new shopping centre. Extra dwellings aren’t required if Council is prepared to claim it has 85 years’ supply. The site is not well serviced by public transport. State Government has refused to invest in the area. It won’t even shift a bus route. C2Z is specifically intended to provide employment opportunities, not dwellings. There’s not a lot going for the idea other than the usual purchase of favours when big money is involved. When a Review is eventually done, I expect Council’s decision to grant the very generous building envelope that it did via a DPO to be closely scrutinized, regardless of the discomfort of current councillors and administration. The Gillon group have learnt from their past mistakes and instead of arrogance they are inviting comment. All of this “investment” by Gillon is designed to appease residents. I honestly can’t see how this is different to what was originally proposed except for the far more generalised language. The only way they can make money is to build apartments and invite supermarkets it. I agree completely with Reprobate’s comments. A master plan is not required. What is going to happen is the same thing – an amendment and then a development plan where residents won’t get a say. There’s also no guarantee that whatever residents say now will be listened to anyway. It is in my mind all an expensive public relations exercise. Someone mentioned that Gillion Group have the backing of liberal Councillors and apparently Hyams has been contacted in respect to round 2 Virginia Park. Make property group do not deal in small fry. They are after major residential development full stop. Increasing the land by at least a third is good for business. Gonna be a long hard frustrating struggle to get this huge chunk of land to be anything other than the high density blot on the landscape. Huge site, gazillions to be made, developers with direct line to the Planning Minister and a Council that has already signalled it wants 10 storey buildings comprising a huge shopping complex, underground parking, topped with apartments. All of this is starting to sound more like another c60 I’m afraid. It will end up at a panel and then council will go ahead and give them what they want and even more. They or the officers have already agreed to reduce the setbacks that happened way back. That is what happened with the village and they just keep on asking for more and more and council gives it to them. Mark my words that if it is these same councillors who are still around by the time it comes to a vote Gillon and his associates will be laughing all the way to the bank. I only feel sorry for those businesses that won’t get their leases renewed and the jobs that will be lost from these businesses. The case will be like C60 and Frogmore. The gang with the help of Pilling then TERMINATOR once a Green now against trees and prefers to cut them down for high rise buildings. 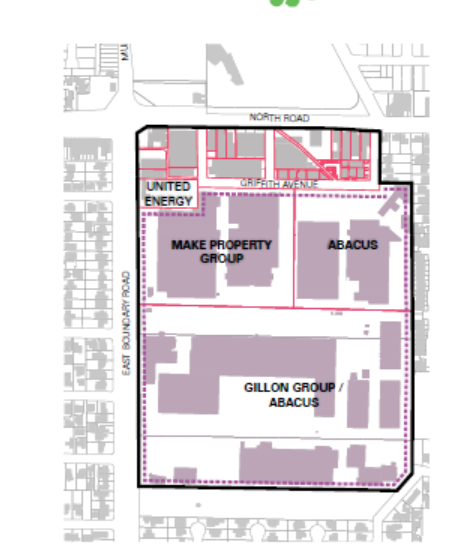 As many visitors to this site would have seen the owners of the East Bentleigh industrial precinct have set up a consultation process as the start of preparing a 20 year master plan for the site. We are keen to get as much community input on this as possible and we can already see there are a range of important issues and concerns being raised here. 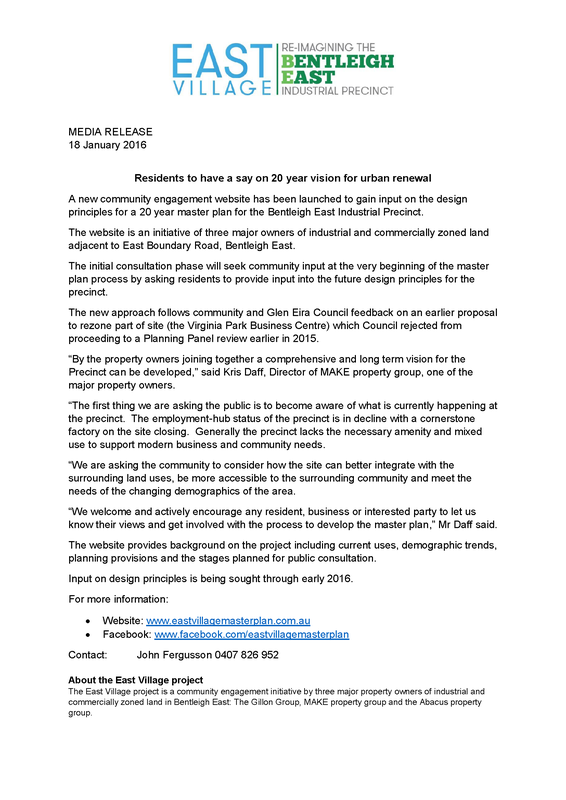 If you haven’t had a chance we encourage you to have a look over the website http://www.eastvillagemasterplan.com.au. We will be posting responses and updates to questions as they are raised. At this stage though we would particularly like anyone who is interested to have a look at the draft design principles for the precinct (see draft principles: http://www.eastvillagemasterplan.com.au/wpcontent/uploads/2016/01/EV_Masterplan_Draft_Design_Principles.pdf). We are also keen for people to get to know what is currently at the site and its declining use as an industrial precinct. The future design principles will need to address this.